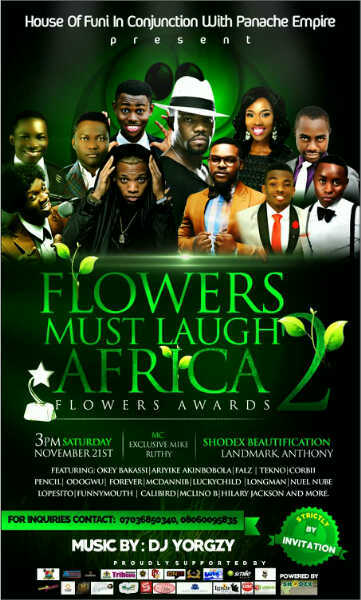 House of funi present flower must laff season 2.0/ flower must laff award. It's Nigeria's number one educative and comedy show. 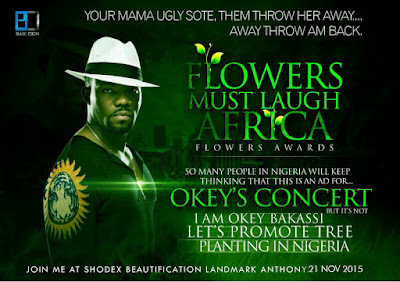 First of Its kind season 2.”Flower Must Laugh Africa" featuring Falz D Bad Guy, Tekno, D elevator, Serene, Okey bakassi, Pencil, Danni B, longman, forever, Odogwu, Mc Lino B, Lopesito, Nuel Nube, jude, peculiar, tungsten, Orhorha, Calibird and the Environment Evangelist himself @funifaze and other performing act Host: Exclusive Mike and Ruthy. This event is sponsored by Guinness, Sannikayz Event, Anchor Insurance and Smile Telecom. Media Partners: Hiptv, Ontv, Sound City, Reel tv, Corazon, Wazobia FM, Unilag FM, Shodex Gardens, Panache_Empire, Sureknakz, Nigeria Tribune, RBvenue Shodex Beautification Garden Anthony. This event holds 3pm prompt 21st of November 2015. For ticket booking, more info and sponsorship details follow @funifaze or call sahar on 08075264392.